Well, perhaps not the “final” Challenge Stage. Wasamin announced last month that after this 28th performance she would be taking a hiatus on doing this monthly event due to the building being remodeled. However, they have been quite vague about when the event might resume, if ever. Personally, I was kind of suspicious about the announcement. Despite the declaration of it being a “Yasumi” (vacation) there seemed to be a bit of finality to the announcement. The fact that the Shinseido staff presented her with flowers at the end of the event didn’t change my feeling either. On the other hand, the construction being done on the building has already commenced, so at least that part of it is absolutely true. Perhaps this is just a temporary hiatus after all. We’ll see. I got out to Kashiwa an hour before the event started. My plan was to find someplace to sit down, relax, and eat lunch since technically I am still battling a cold, as well as a toothache. I passed by the stage area on my way to Choco-Cro and saw a bunch of people, including Wild-san, had already staked out their spots close to the stage. I had no intention of standing there for an hour, so I continued to the cafe…. By the way, Choco-cro had this new “Taco Sandwich” which was quite good. Taco meat, cheese, lettuce, and tomato on a roll. It seems Mexican styled food is really growing in popularity around Tokyo. In fact, MosBurger is currently featuring a “NaanTaco” which is essentially the same taco ingredients on a piece of Naan Bread. Anyway…. 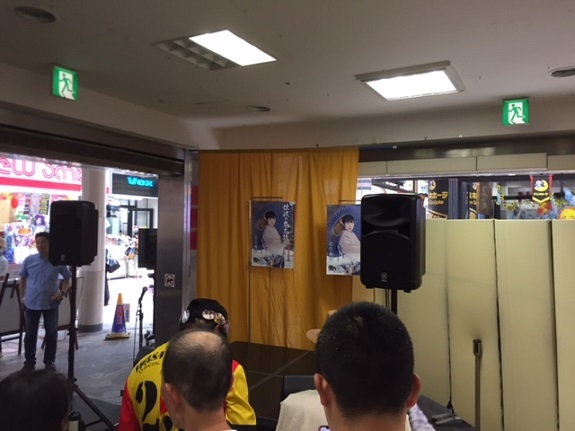 Since this was the “final” event Wasamin drew a fairly large crowd of fans, not to mention plenty of passers-by as this is a popular shopping area, the line for handshakes and 2-shots was fairly long. I walked across the street to the ABC Mart to check out their shoe selection since I am in dire need to new shoes. Eventually I went back across the street to queue up. I had three tickets, and planned to use them for one shamekai (2 tickets) and one regular handshake. This is the same pose the previous fan took, and is sort of a take on one of the poses she does while performing Sado no Ondeko. In the meantime I told her that I had been under the weather. She asked if I was going to the doctor. I told her I was buy studying for Japanese exams. She wished me luck on my exams as I went to queue up again. So I started telling her about my trip being cancelled, and I would be able to go to her upcoming release events. Wasamin immediately interjected and asked me if she was #1 in my heart. I was like “Huh?” She went on to say that she reads my social media and sees me talking about other idols. She specifically brought up KissBee, which I thought was somewhat odd since I haven’t talked about KissBee in quite a while. Anyway I was stammering, she and Ichikawa-san were laughing. I just kept repeating that I loved Wasamin and that she was my #1 girl. But she kept countering that she wonders since I talk about other idols. Now on one hand, I know she was just playing with me. And in one respect this is kind of “next level” stuff, as she likes to mess with her fans, but she has always spared me a bit because of the language barrier. So for her to bring this up is kind of a compliment. However, I would be dishonest if I didn’t say it hurt a little bit. Sure, I do see other idol groups and idols, but there should be no doubt whatsoever who is #1 in my heart. Ultimately I ended up tweeting our 2-shot, declaring her my #1 “best girl.” I’m sure she got a kick out of it. Wasamin was presented flowers from the CD shop at the end of the event, and I eventually made it back to the train station and back home. 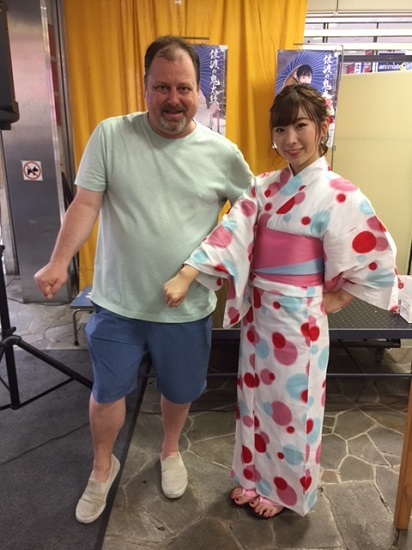 Wasamin is in Shizuoka for the rest of this week. Beginning next week she will be doing two weeks of appearances in Tokyo, Saitama, and Kanagawa, with a big promotional push from August 8th through the 13th, so plenty of Wasafun coming up.